Asparagus heralds the arrival of Spring with spears standing upright on the green grocer’s shelves and farmer’s markets, or if you’re lucky, in your own garden! My aunt and uncle who live part of the year in Friuli (north-east Italy) and the other part at the family villa and farm in Campania (south-west Italy) have immense passion for good food. In fact, we all do! 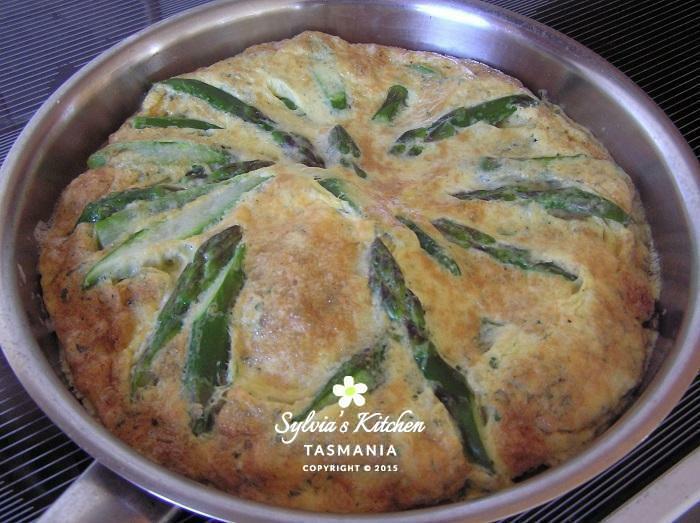 Whilst visiting them in late winter/early spring and as part of a long lingering lunch consisting of over five courses, my uncle cooked a sublime Frittata using wild asparagus he foraged and picked from the hills surrounding Trieste, in Friuli. It was such a memorable dish and culinary experience! Grazie mille Enzo! The recipe I share with you today is simple and enhances the asparagus flavour. I cook this for simple lunches when we are working in the garden, for supper or when entertaining friends on impromptu spring visits. Break off the tough ends from the asparagus spears and discard, better still, compost. 🙂 Blanch asparagus in boiling salted water until just tender. Drain. Run under cold water to refresh. Set aside. Break eggs into a bowl. Whisk in a little salt, pepper and freshly grated nutmeg. Add most of the shredded mint or parsley and half of the Parmesan. Heat olive oil in an oven/grill proof fry pan, with approx. 2cm sides, on medium-high heat. Coat pan with the olive oil then add garlic if using. Stir quickly to cook then immediately add the egg mixture. Lower heat. Cook until eggs begin to set but are still moist. Gently loosen the sides of the egg mixture with a spatula. Lay blanched asparagus spears on top. Scatter over remaining mint or parsley and Parmesan. Place the fry pan in the oven or under the grill for about 1 minute or so until the frittata is light golden and puffed (as photo above). Remove from oven or grill. Set aside to rest for a minute or two to allow the frittata to contract and loosen itself from the fry pan. Cut frittata into wedges and serve with a freshly dressed York Town Organics Cos and Rocket salad and crunchy ciabatta bread to dip into Lentara Grove or Coronea Grove extra virgin olive oil. Easy and delicious! Buon appetito! This entry was posted in Gluten Free, Local Produce, Low Carb, Recipes, Spring, Vegetarian and tagged Anzac Biscuits, Local Produce.